Chris Nash has been granted a Testimonial Year in 2017 by Sussex. The 33 year-old batsman has been at the heart of Sussex Cricket for nearly the past two decades, having joined the club as an eight-year old. Born locally in Cuckfield, Nash made his first-class debut for Sussex back in 2002 and has since gone on to play 165 first-class matches for the club, scoring over 10,000 runs, with his highest score of 184 coming against Leicestershire in 2010. He made 1256 runs in the Specsavers County Championship in 2016, averaging 54.60. 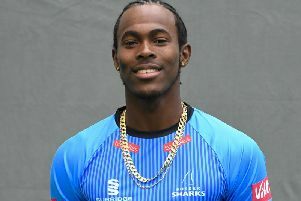 He is also closing in on 3,000 runs in List A cricket for Sussex, and has made over 2,500 runs for the Sharks in the NatWest T20 Blast format. He has played over 400 matches for Sussex across the three formats. In terms of trophies won for the club, Nash is one of Sussex’s most decorated players, being part of the squad that won the County Championship in both 2006 and 2007, including the double with the C&G Trophy in 2006, Pro40 titles in 2008 and 2009, as well as the Sharks’ 2009 Twenty20 Cup victory. Nash’s charities that he has decided to support are Rockinghorse Children’s Charity, and the Sussex Cricket Foundation. Rockinghorse are the official fundraising arm of the Royal Alexandra Children’s Hospital in Brighton, aiming to make life better for sick children in Sussex. The Sussex Cricket Foundation (SCF), was launched in 2015 to build better futures and stronger communities through the power of cricket, and to make a real and sustained difference to people across Sussex through the sport. His launch event will take place on Friday 10th March 2017 at The Grand Hotel in Brighton, with a full range of events to follow in due course. Nash said, “To be awarded a Testimonial Year is a huge privilege. Having started playing at Sussex as an eight year-old, it was always my dream to play first-team cricket here. “To have played over 400 games, won trophies and have a lot of personal success is something my family and I are very proud of. I hope to play for many years to come and help the club back to winning ways with a very promising squad. Sussex’s Chairman Jim May said, “Chris Nash has been a tremendous player for Sussex over many years. His ability to play a major part in all competitions makes him a very valued cricketer.